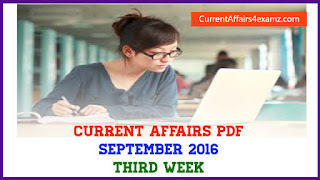 Hi Aspirants, here is the Current Affairs Quiz for 16 September 2016 useful for upcoming IBPS RRB, PO, Clerk 2016 & other competitive exams. 1. Pushpa Kumar Dahal ‘Prachanda’ who arrived in India on 16 September 2016 is the Prime Minister of which country? 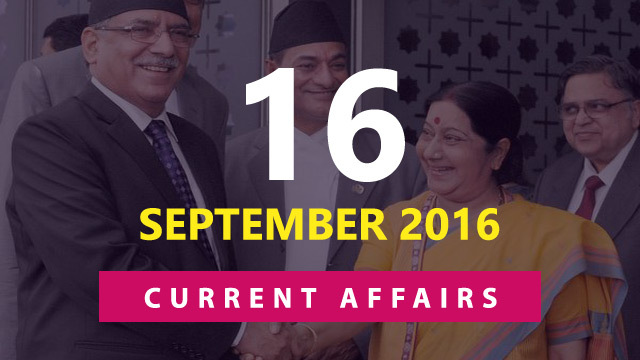 Note: This is his first visit abroad since being sworn in, Nepal’s Prime Minister. 2. Which among the following book was not shortlisted for the 2016 Man Booker prize? Note: 2016 Man Booker prize will be announced on 25 October at Guildhall. 3. Name the India-born researcher who was on 14 September 2016 chosen for the prestigious Marconi Society Paul Baran Young Scholar Award? Note: Bharadia was chosen for his contribution to send and receive radio (wireless) signals, including mobile telephony and data on the same channel. 4. Who has recently become the first Indian star to enter the Forbes list of highest paid television actresses in the world? Note: Priyanka ranks eighth in the list, which has retained American actress Sofia Vergara at the first position fifth year in a row. Priyanka achieved the distiction after starring on American series Quantico. 5. International Day for the Preservation of the Ozone Layer is observed on? Note: The 2016 International Day for the Preservation of the Ozone Layer was observed across the world on 16 September 2016. The theme for the year 2016 is Ozone and climate: Restored by a world united. 6. Which team recently won the MCC Murugappa Gold Cup Hockey Tournament 2016? Note: In the finals Indian Railways Hockey Team beat Indian Oil Corporation Team by 2 – 1. 7. United States President Barack Obama on 15 September 2016 designated the country’s first marine national monument, Northeast Canyons and Seamounts Marine National Monument in? 8. Yudh Abhyas 2016, a joint military training exercise of Indian and US Armies, commenced on 15 September 2016 at? 9. India recently (September 2016) declared itself free from which disease? 10. Name the winner of the 2016 Calcutta Football League? Note: The team defeated Mohammedan Sporting 1-0 at the Kalyani Stadium. East Bengal bettered its own record of winning it six times straight from 1970 to 1975.